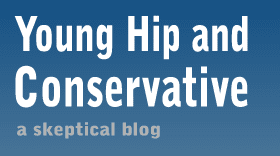 Young, Hip and Conservative: a skeptical blog: Why did gay marriage fail in Maine? Regardless of opinion on the issue. Or that the voters were swayed by faith. I still consider this vote a success. The majority won so as not to apease a minority. Although I am for gay marriage the will of the people is different. Random question, is it always fair to let the feelings of the majority dictate the laws of the minority? Perhaps we should just declare that being gay is a new religion and thus gay marriage is the same as any other religious marriage in the eyes of the government. Also, then there would be no ability to vote on it due to seperation of church and state. The problem with that is it would be overturning a fair vote. As disappointed I am with the results in Maine, I don't wish to "win" through the court system. Because this is a social fight, we can only win if we get the majority of people on our side. And we certainly are getting there, it's just taking longer than we thought.